Chicago-based Law school offering programs to JD, LLM and MJ students. 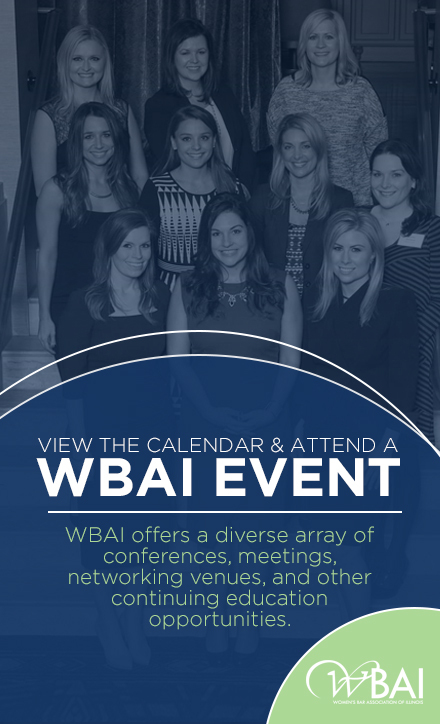 I am a member of the WBAI because it offers wonderful opportunities to network with other women attorneys in the state (especially our alums), to provide support for each other and to celebrate each other. When I came to Illinois about 10 years ago, the WBAI immediately welcomed me with open arms as one of their own. Although women comprise over 50% of the students in law school , women in leadership positions in the profession is only 20% and climbing slowly– WBAI recognizes and seeks to meet the needs of women in the legal profession to make sure they survive and thrive. It also involves students from local law schools so they can be mentored early in their careers, which is so important! What do you think is the best way to empower women in law? OR What are the qualities you have seen and admired in a senior female attorney you know? Tell us about a story or time when being a female attorney was advantageous. Some of the qualities that I admire in other senior female attorneys I know are their authenticity and their courage to make a difference in their organizations — even though taking such a risk might be unpopular, against expectations, or even jeopardize their own careers. What I appreciate about being a woman lawyer (for over 30 years now!) is that – although we have some similar experiences — we are all unique and are freer to bring those unique experiences to the table, wherever we are sitting. When I was interviewing for law firm jobs in the mid-80s, we all were expected to wear dark conservative suits, plain pumps, and white blouses with bows. I was asked to take my social work background off my resume when I did on-campus firm recruiting, as if my prior professional interests were not value-added. Although women still walk a tightrope, we are better able to be our authentic selves, which better serves our institutions and makes us much happier people. Wherever I am, I am a woman/Latina/Italian/mom/wife/firstgen/runner/socialworker/steeltowngirl, and at this point in my career I can be proud of all of those identities. What are you most looking forward to in the following year, personally/professionally ? In the next year, I am looking forward to my daughter becoming a senior at DePaul; to finishing my first sprint triathlon; and to continuing to work with my wonderful colleagues, students and alumni at DePaul Law and help realize our ambitious goals. I am a huge fan of Soul Cycle. My sheroes (non-law) are Madonna, Jennifer Lopez, and Lady Gaga – for their passion and perseverance.